Say a prayer for the Middle Dutch Church (pictured here from sometime before the war) as things are about to get very ugly. One need only walk through the Limelight Marketplace — perhaps stopping to grab a slice of Grimaldi’s pizza or a champagne damask lace duvet at Brocade Home — to understand the strange flexibility of church architecture. I’ve pondered before on this former Richard Upjohn-designed Episcopal church at West 20th Street and Sixth Avenue, transformed into a rehab center in the 1970s, then a notorious nightclub in the ’80s. But the Limelight is only the most extreme example of church alteration in New York. Brooklyn Heights has so many churches that some have been turned into swanky loft apartments. This is not a new trend. 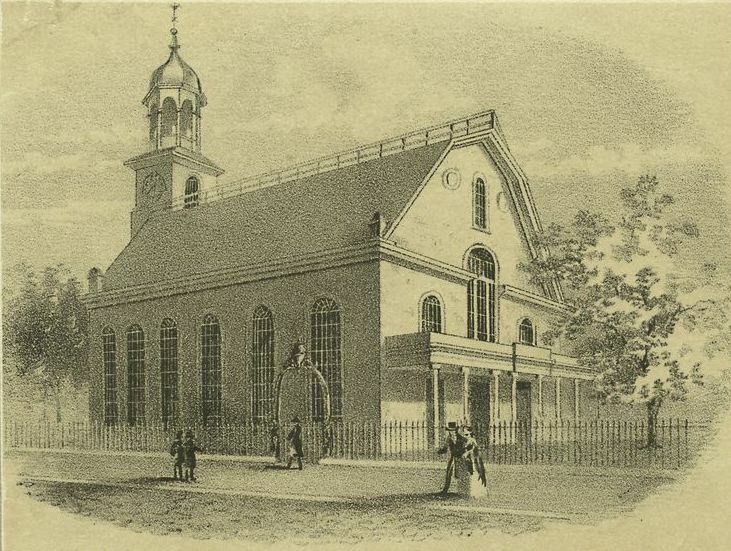 New York grew so rapidly in the 19th century that small stone and clapboard churches, once situated on the outskirts of town, found themselves surrounded. As population shifted, congregations left, and other civic services moved in. The Middle Dutch Church was built between 1726 and 1731, a vestige of Manhattan’s Dutch Reformed community that traced itself back to New Amsterdam‘s very first house of worship. Its location at Nassau Street and Cedar Street made it central to the lives of colonial New Yorkers, but a series of historical twists ensured a few less hallowed activities would take place here. Below: The church and the adjoining ‘sugar house’ in 1830, years after being turned into a horrifying prison complex. “The whole floor of the Church was one caked mass of dead, dying, excrement and vermin,” reported the Times, “supernatural” conditions that probably echoed throughout the entire city, choked off during the occupation years between 1776 to 1783. 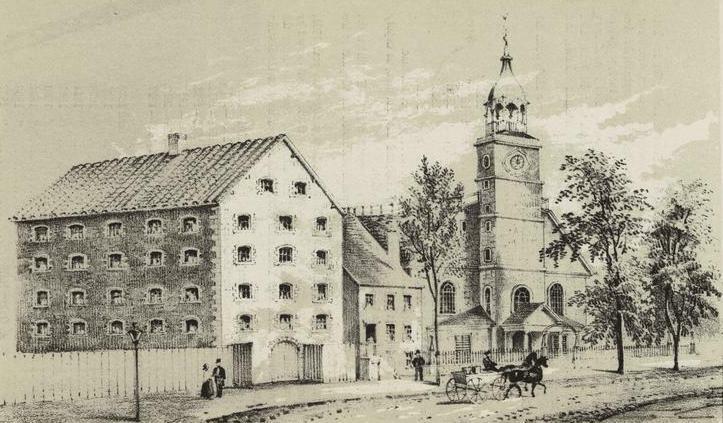 When the British galloped out of New York entirely in 1783, the beat-up old building sat virtually unused — although Benjamin Franklin may have used the belfry for electricity experiments, according to one source — before being turned back into a church, re-opening on July 4, 1790. It stayed as a church for 44 years, even as New York’s population migrated north. Under a cloud of debt, the church finally closed in 1844, with its final service symbolically held in both English and Dutch languages. If Franklin (America’s first postmaster general) indeed practiced with electricity here, then the next transformation seems natural. With the federal standardization of postal rates in 1845, New York found itself in need of a central post office. So the U.S. government leased the old church — buying it outright in 1861 — and radically transformed the building into New York’s central post office. 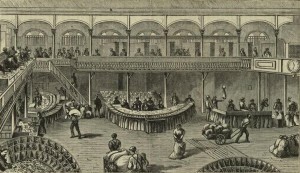 The poor building, renovated and stretched thin, could barely process the flow of mail coming through the city by the late 1860s, so a new central post office was built — the odd, greatly loathed City Hall Post Office building. 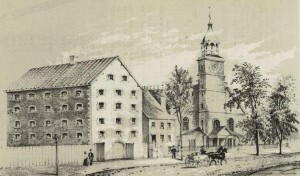 The old Dutch church, now 150 years old, was considered a city treasure, but real estate in downtown Manhattan was now being carved out for skyscrapers. The church of a thousand faces, to the curiosity of “thousands of relic-hunters and citizens,” was finally torn down and replaced with the Mutual Life Insurance Building in 1882. The ornate Mutual Life had a good run but was demolished — with a part of Cedar Street erased — to make room for One Chase Manhattan Plaza. ← The Bowery Boys back catalog — fully illustrated!